TOOLS Carving knives, chisels, sanding sealer, wood oil etc. SPECIAL OFFERS Discounted prices on selected items NEW! Page last updated March 2019 - click on "Refresh" or "Reload" to ensure you see the latest information each time you visit. Please note - all shanks are sent by Courier and require a signature on delivery. Please don't ask for them to be left "behind the shed" etc. as we just can't tell the drivers to do this! Small packages will normally be sent by 1st Class Mail. 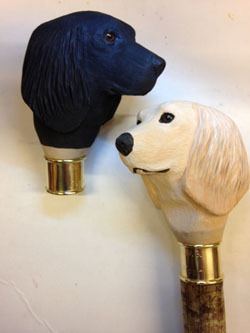 Please note - if you are ordering shanks and other items that you wish to match (such as ferrules, collars etc.) please tell us on your order form (use the Technical instructions information box) or email us and we will do our best to send matching sizes. If you order incompatible sizes we can correct them and alter prices before payment is taken on a card - but ONLY IF YOU TELL US YOU WANT THINGS TO MATCH. It may seem obvious to you that they are to match but often customers buy items for existing projects and a shank or two for later work. We can not read minds, though sometimes it would be useful! It would also be advisable for you to tell us any specific requirements regarding shank thickness, colour etc. as we have quite a selection from which to choose. As soon as you order anything your order form has a box for "Technical instructions" where you can leave specifications. Many of the shanks we sell are "Seasoned-only" and have been air dried (typically for anything between 10 months and two years) or occasionally kiln-dried. (See lower down for Seasoned and straightened shanks). Moisture content with air dried sticks varies but will normally be between 15 and 20% when measured with a digital moisture meter. Some further drying is likely if you take the sticks indoors, especially to very warm, dry conditions. These sticks are graded by us and are LIKELY to require straightening if you like straight sticks (see the STICK PRESS below). I won't send you anything that can't be straightened if you use my methods - I keep the really awkward ones to do myself or we class them as "misshapes". Diameter at the top is typically around 7/8" (22 mm) to 1 1/8" (28 mm). Most shanks taper from top to bottom and some have lots of knots - others very few or none at all. All have the bark left on, unless stated. We cut most of these sticks ourselves but predicting demand a couple of years in advance - so they have time to season - is difficult and there are times when we run out of some of them or have to buy them from other sources. Although we nearly always have hazel, we do sell out of some of the other "seasoned only" sticks. We tried some a few years ago to see if they would be popular - wow, were they popular! We cut a lot more the following winter and they sold out too! Ash is becoming difficult to source now because of "Ash Dieback Disease" but we still have a few left - we may not cut any new ones this year though. The most popular material for stick shanks in the UK and we try to keep it in stock. Bark colour varies from pale, silvery-grey to very dark brown, mottling and striping often shown. Some hazel is very knotty, some has hardly any knots at all. If you have very specific requirements please contact us before ordering. These graded sticks have been checked over and any with damaged bark, dogleg kinks or other serious flaws have been removed and are sold as "Misshaped" shanks, which you will also find below for sale at a much reduced price. 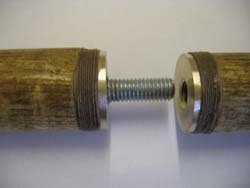 Most will still require some degree of straightening and are not suitable for the fitting of screw joints in the middle - you need straighter sticks for those. 35", 42", 48" or 54" long - put the number of any you want in the Qty (quantity) box then click on the "Add to cart" button below the section. Although we will send out single shanks they are difficult to pack so that they are strong enough to withstand the rigours of transit. We recommend that you buy several shanks at one time if you have several projects lined up in the future. Not only are they more likely to be delivered intact but shipping is cheaper per stick for you! NB WE ONLY SUPPLY "HOBBY" STICKMAKERS AND CAN'T SUPPLY IN WHOLESALE QUANTITIES. All shanks are sent by Courier and require a signature on delivery. Please don't ask for them to be left "behind the shed" etc. as we just can't ask the drivers to do this! Hazel shanks 54" SEASONED Only (Not straightened). 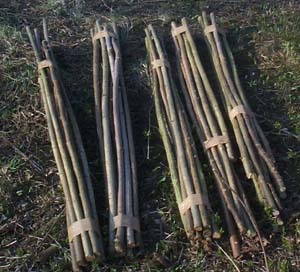 Hazel shanks are cut and bundled in the woods before being stored under cover for one to two years to season. Hazel Standard Grade, 7/8th inch to 1 1/8th inch (22 mm to 28 mm) at thickest end. Hazel Lightweight Grade less than 7/8th inch (22 mm) at thickest end. Hazel Heavy Grade more than 1 1/8th inch (28 mm) at thickest end. ASH Bark normally grey, sometimes with a green tint which slowly fades. Lightly sand or scrape the top layer to reveal a lovely olive-brown under-bark. Often very knotty bark - sand down or leave standing slightly proud. Ash takes stain very well and can look quite striking when stained dark brown, the really knobbly ones looking like thorn wood. Wood under the bark is almost white. Ash shanks 52" SEASONED Only (Not straightened). Blackthorn shanks 36" SEASONED Only (Not straightened). Blackthorn shanks 48" SEASONED Only (Not straightened). Blackthorn shanks 54" SEASONED Only (Not straightened). BLACKTHORN Very hard wood with deep reddish brown, purple or black bark - often very knotty. I only cut a few of these each year so stock soon runs out! True Blackthorn, often fairly straight to begin with but will need to be straightened further (ALSO SEE STRAIGHTENED APPLE SHANKS BELOW). Three lengths (36, 48" or 54") around 23 to 27 mm thick at top, or Lightweight shanks thinner than 23 mm. Most Blackthorn is oval or flattened in cross-section rather than circular, making it more difficult to get a neat joint with the handle or head unless a spacer or collar is used. Although we will send out single shanks they are difficult to pack so that they are strong enough to withstand the rigours of transit. We recommend that you buy several shanks at one time if you have projects lined up in the future. Not only are they more likely to be delivered intact but shipping is cheaper per stick for you! Forked Hazel Thumbstick "Blanks" SEASONED Only (Not straightened). We have a number of these surplus to our requirements so, as we did 2 years ago, we're letting these go VERY CHEAPLY at just £30 for five sticks (plus delivery if required). They may have uneven forks or may be quite knotty or a bit crooked - but will make good working grade sticks for beating etc. or for making sticks for children. Most will need straightening just like any seasoned-only shanks. Length in each pack will vary from around 46" to 56" just as we cut them, though most are nearer the top length. HAZEL seasoned and straightened. We never have large stocks of ready straightened Hazel and tend to straighten them in small batches or as they are required. These are normally straightened by us using our own STICK PRESS (see below) although we may need to buy in if we run short. Three basic grades are available - Standard is the most commonly requested and will suit most types of stick. 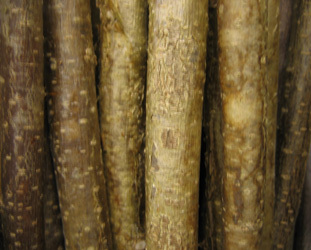 Many of these can be further straightened by the application of heat and use of a stick press (see below). Premium grade sticks are more regular in diameter, straighter than the Standard grade and often show more interesting colours and bark patterns. Length 52" to 54". Lightweight sticks are not as thick as the Standard or Premium grades but make good shafts for sticks meant for smaller ladies or children. Put numbers in the quantity boxes below and CLICK the "add to cart" to make your selection. Hazel shanks 48"+ Seasoned & straightened. Hazel shanks 52" - 54"+ SEASONED AND STRAIGHTENED. 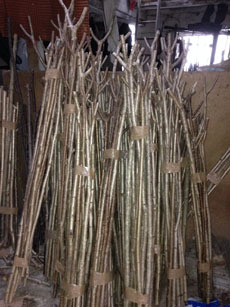 Qty OUT OF STOCK Hazel PREMIUM Grade 52" - 54" £12.90 Each. at thickest end. Good, usable sticks for most purposes - our most popular straightened shank. at thickest end. Most suited for lightweight sticks for children or smaller adults. at thickest end (no really thin or really thick ones) and better overall quality than the standard grade. Nice patterning but slightly irregular cross section or more knotty than Premium grade. Showing nice mottled/banded patterns of black, green or brown on a paler background over most or all of the shank (more or better colouring than "normal" hazel). Those pictured have no finish - but once you oil or varnish them at home they can look really stunning! Careful sanding before finishing can enhance the darker patterns. SHANKS CAN NOT BE SHIPPED OUTSIDE THE EU! Prominent knots and very dark bark colour - deep brown to black - very similar look to Blackthorn (it has fooled many people!). Most shanks taper from top to bottom. We sometimes have these with the bark peeled off (please email first to confirm availability). Standard grade typically 7/8" (22 mm) to 1 1/8" (30 mm) at the thicker (tapering down to the thinner end) end but occasionally outside these limits. Premium grade more regular shape and size with good bark colour and condition. We don't have many of these and there are times when we only have the standard grade. If you have very specific requirements please contact us before ordering. Chestnut shanks, seasoned and straightened - with bark on. Chestnut shanks 52" - 54" SEASONED AND STRAIGHTENED. Straightened in lengths 52" TO 54", generally around 23 to 26mm at thicker end, Lightweight grade is 20 to 22mm, Heavy grade is 27-32mm. PUT A NUMBER IN ONE OR MORE "QUANTITY" BOXES ABOVE THEN CLICK ON THE ADD TO CART BUTTON. 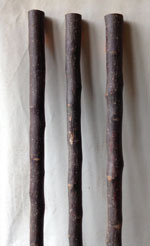 Blackthorn shanks 42" - 46" SEASONED AND STRAIGHTENED. Blackthorn shanks 54" SEASONED AND STRAIGHTENED. True Blackthorn, Prunus spinosa, only a few cut each year so OUT OF STOCK AGAIN! Straightened in lengths 52" TO 54", generally around 23 to 28mm at thicker end. VERY SIMILAR to Blackthorn! Incredible dense, regular knot pattern, rich dark colour - many people are fooled into thinking they are Blackthorn. These are a pale grey colour but take stain well and can look stunning when stained very dark brown or black! Very knotty - can look similar to blackthorn if stained. Peeled ash shanks are almost white and very similar to peeled Holly. Only a few left. Steamed Chestnut stick with bark peeled off, ready for you to finish off in any way you choose, e.g. staining or carving. Also very suitable for pyrography work. Length approx. 36" from top of curl to tip. Used for straightening seasoned sticks - will fit most woodworking vices (vice NOT included with press) and enginneers vices . Full instructions supplied - the way I straighten my own shanks and the tool I use for teaching others in my Stickmaking Classes. Save yourself a load of money by straightening your own sticks, OR buy "Seasoned only" sticks and straighten them yourself! Amazingly, we have now sold over 1,500 of these! We make these ourselves and are selling several every week - over 900 sold in all! There must be lots of you who wanted to straighten sticks but didn't know how to! We're also selling far more 'seasoned only' sticks than before so the stick presses obviously work for you! The two pictures on the right show just what can be done when you have the right tool! DON'T CONFUSE THIS WITH AN INFERIOR PRODUCT BEING SOLD ON EBAY! 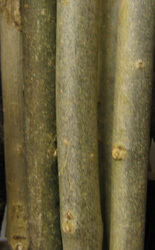 Below: Very bent stick before and after straightening with the press. It took me less than 10 minutes to straighten this 54 inch blackthorn stick! We don't normally cut sticks this bend but blackthorn is worth having, no matter what it's like! You need some form of heat to soften the sticks before straightening. 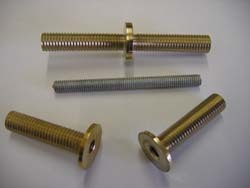 Two brass parts and threaded steel insert. 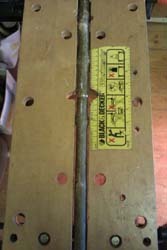 Use 1/2" or 13 mm drill bit (see TOOLS page) for holes in stick and use epoxy (below) to glue into holes. I find the steel rod supplied is often longer than required so use epoxy to glue one end into the internal thread then cut the exposed part in half with a hacksaw. You can also cut the brass part shorter if required. I use strong thread to whip behind the brass to strengthen the stick and prevent it from splitting around the joint. Any thread will do - I don't stock it, sorry. 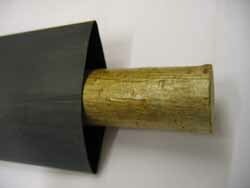 Brass, as in pool-cues, to make a collapsible stick. 25 mm diameter flanges (file down easily to smaller sizes). Essential if you are taking your stick on an aeroplane! You can also use these for making one stick with two or more heads or handles. On the left is a "Workmate" type bench with the two parts lined up. On the right there are two identical woodworking vices, each holding one part of the stick to be joined. The stick needs to be as straight as possible to get a good result - even then, you might find you need to "tweak" the straightening after fitting because the two halves don't always end up in the same alignment as before. 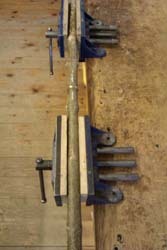 You fit a joint without any vice at all - by gluing one half into one part of the shank and letting it set - then gluing the other half and holding it upright (one end on the floor) until that starts to set. Keep checking the alignment for a few minutes as it sets and just tweak the positioning until it sets completely. I do thisall the time now and it does work really well if you are careful! NB WE DO NOT FIT THE JOINTS FOR YOU IF YOU ARE ORDERING DIY SHANKS. 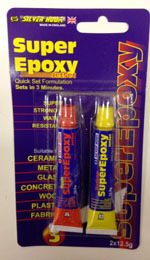 Two-part epoxy - mix equal amounts of adhesive and hardener together to start the setting reaction. The mixture sets slowly, starting off quite soft like Plasticine and slowly getting harder. In effect you have an hour or so before the mixture gets too stiff to work and it's pretty hard after three hours and can be handled after that. Black or white can be found on the TOOLS page. Black or brown available (Click on circle to change) if we are out of stock of your chosen colour we will send the other (unless you tell us not to). Wading staff conversion kit. All the bits you need to convert your own stick into a Wading Staff. 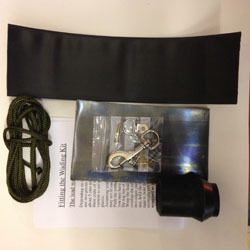 Kit includes lead sheet, shrink tube, nylon parachute cord, clips, pins, brass screw and rubber ferrule (23 mm unless you ask for different). Instruction sheet for fitting the kit included. Shrink tube 38 mm £2.10 per 20 cm length. Amazing stuff! 38 mm diameter shrinks to 19 mm when heat is applied (I use a paint-stripper gun) but length stays the same. Just slide it onto the stick and apply heat gently - increase the heat until shrinkage begins. Forms a tight plastic cover. Can be used on metal, too. Stops soft wood and cane from fraying. Makes metal "warmer" to the touch. Small plastic compass - diameter around 3/4 of an inch (20 mm). Fit into handle of hiking stick or glue one of these to a piece of polished wood or horn and fit a leather loop to make a simple gift for a walker. Note: There may be a small air bubble inside the compass - this should float above the dial. During shipping the bubble may become trapped below it and stop the dial rotating - try tapping the compass on its edge on a hard surface to dislodge the bubble then place upright and allow to settle. Close proximity of any iron/steel may affect the correct functioning of the compass so DO NOT fix steel studding near it! 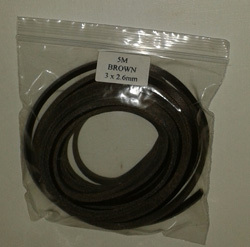 Dark brown or Black, for wrist loops, whistle lanyards, boot laces etc. Sold in (approximately) 5 metre packets so you can cut your own lengths. The lace is approx. 3 x 2.6 mm square in cross-section but can be rounded out and softened by pulling through abrasive paper or tape.